Sous-vide cooking with liquids can be a hassle because liquids will be sucked out by my vacuum sealer (as I don’t own a chamber sealer). The usual solution is to freeze any liquids before adding them to the pouch. 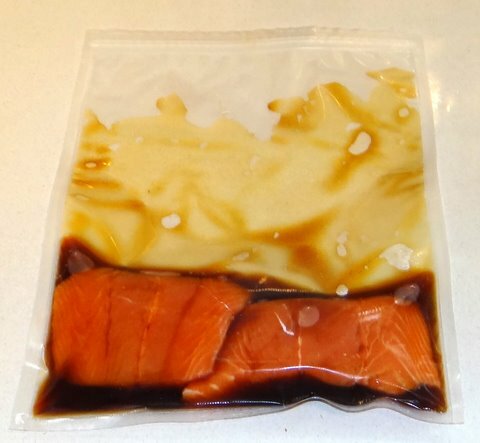 The folks at SousVide Supreme have come up with a solution and now sell zip pouches suitable for sous-vide cooking. You can get most of the air out simply by submerging the pouch into the water bath, letting the air escape and then sealing with the zip. 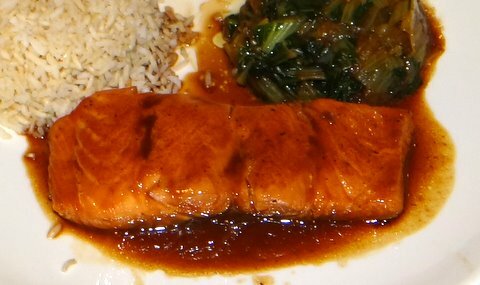 When my trial batch arrived in the mail, I decided to try it with salmon teriyaki. I used farmed salmon because wild salmon is only available frozen and frozen wild salmon is too dry. I washed the salmon with cold water and dried it with paper towels. 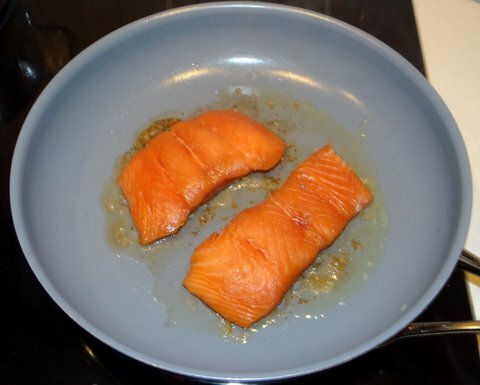 I cut the salmon into serving pieces (about 150 grams or 1/3 pound each) and salted them lightly. I then put the salmon away in the fridge to keep cool. 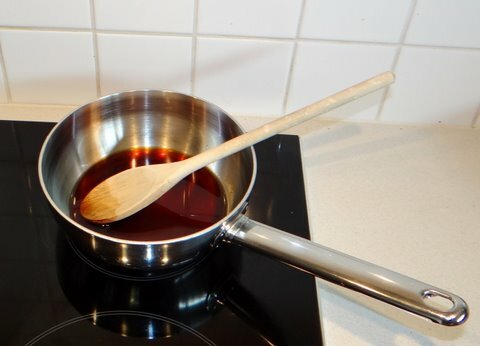 I prefer to use my own teriyaki marinade, because most of the ready-made teriyaki marinade on the market contains all kinds of ingredients that shouldn’t be in there. 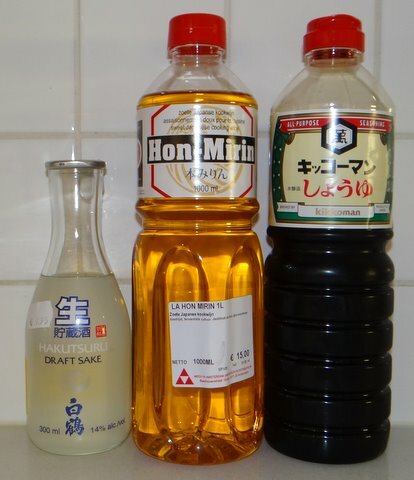 Teriyaki marinade is made from sake, mirin, soy sauce, sugar and nothing else. 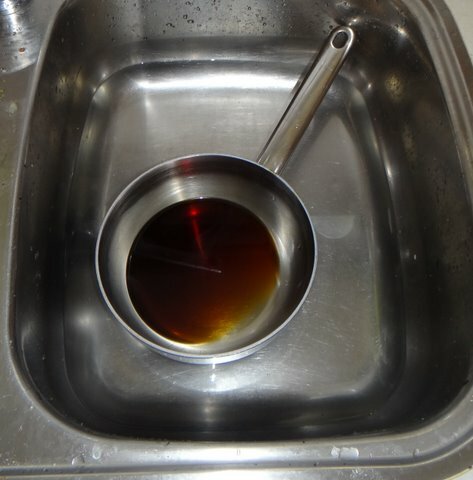 Then I quickly cooled the marinade by filling the sink with cold water (no ice cubes needed this time of the year) and putting the saucepan in and stirring. 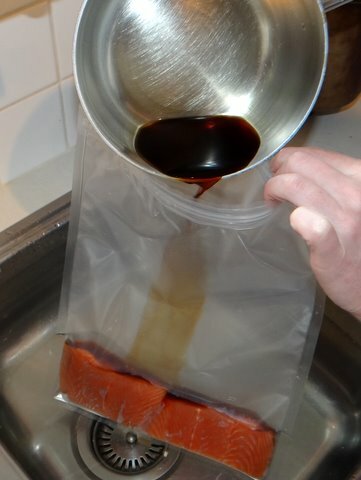 I put the salmon in the zip pouch and added the teriyaki marinade. I then submerged the pouch into cold water and sealed it with as little air inside as possible. As a result there is still some air in the pouch but not much. The little bit of air is no problem for cooking sous-vide. If there is too much air, the bag will float and the heating will be less even. But there is no need to obtain a very tight vacuum. 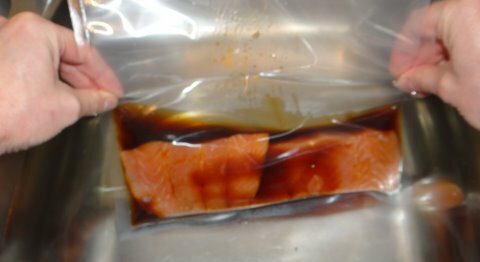 I let the salmon marinate in the fridge for 5 hours or so to let the marinade infuse the fish. I then gave the salmon a very quick sear (just a few seconds per side) in a table spoon of hot butter (yes, butter! this helps to get a nice glaze) in a non-stick frying pan. 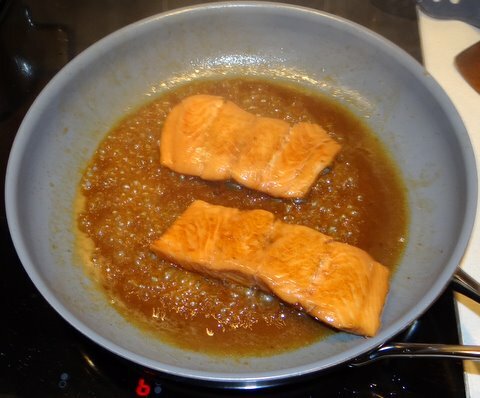 Then I turned off the heat and added the marinade from the bag and quickly turned the salmon to coat on all sides. I tried to work as quickly as possible to not let the salmon overcook. The zip pouch was very easy to use, so this was definitely not the last time I’ve used them. Perhaps you are wondering whether it was safe to cook salmon this way since 43C/109F is too low a temperature to kill bacteria. 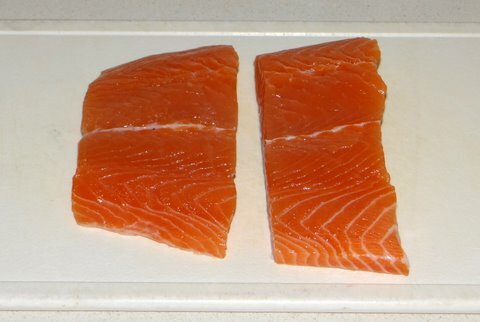 Since it was very fresh salmon, fresh enough to eat raw as sushi, and since the time that I kept it at 43C/109F was much shorter than 4 hours, there is no real risk. Furthermore I washed the outside of the salmon (that is where any contamination would be) and did a quick sear over high heat. We drank an Italian pinot bianco from Alto Adige with this that paired very well. With teriyaki you need a full-bodied round aromatic dry white wine that is not too dry. Such wines can for example be found in Alsace (France), Mosel (Germany) or Alto Adige/Südtirol (Italy) and are made from pinot bianco/pinot blanc/weissburgunder, pinot grigio/pinot gris/grauburgunder or gewürztraminer. Not all wines of these grapes are good matches, for example pinot grigio from Veneto will usually be too dry and not aromatic and round enough. This fish will haunt my dreams, Stefan. I love your preparation of the perfectly cooked fish and the unadulterated Teriyaki sauce. Very pure. This teriyaki marinade has become my go to for quick and tasty. I love to marinade chicken in it, but it worked also great in a stirfrie with bimi and cod. Will never buy a premade bottle again.